I took this picture of the field where the next full-service Duncan Aviation facility will break ground. The view from the front lobby will be the majestic Wasatch Mountain Range. 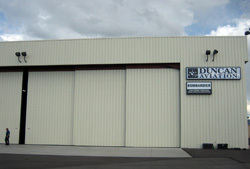 Duncan Aviation-Provo currently leases hangar space at the Million Air-Provo facility. I've been at Duncan Aviation for 34 years. During that time, I've witnessed many changes. The company started as a small aircraft distribution company in 1956. I joined in 1976, and I've watched it grow into the largest, family-owned, full-service aviation maintenance company in the world. The key to surviving three generations and five decades is to embrace change. We've always listened to what our customers are saying and are willing to try something new to be innovative. It is because of this customer-focused innovation that we are now experiencing one of the most exciting changes for Duncan Aviation. 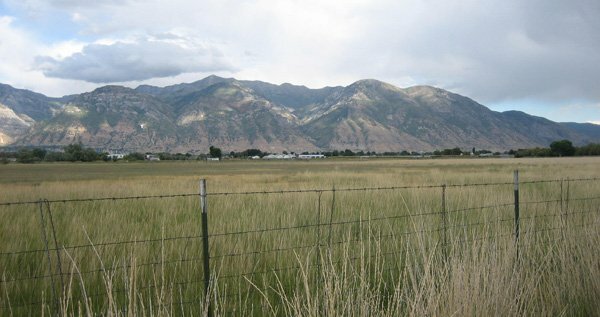 On August 1, we opened a third maintenance facility in Provo, Utah. It is currently a fraction of the size of our other facilities but is staffed with experienced Duncan Aviation experts and equipped with the latest technology to provide major and minor hourly and calendar inspections as well as line-level engine and avionics support. I got to travel to Provo recently to participate in the Duncan Aviation Customer Advisory Board, where we give customers a voice in how we conduct business. While there, I was amazed at the beauty of the hangar. Duncan Aviation has always been known to have the cleanest hangar floors in the industry. It is nice to know that some things won't change. On a break, I looked out over the field where the next full-service Duncan Aviation facility will break ground and it gave me chills. The view from the front lobby will be the majestic Wasatch Mountain Range that rises directly north of the city of Provo. This afternoon, we announced another change. Duncan Aviation-Provo was named a Bombardier Authorized Service Facility for scheduled and unscheduled warranty and maintenance work for Learjet 40, Learjet 45 and Learjet 60 aircraft as well as for Challenger 300 and Challenger 600 Series aircraft. Provo's capabilities include line service and around-the-clock aircraft-on-ground (AOG) services for Global Express and Global 5000 business jets. For 34 years, I have seen where we were, where we are and where we are going. It is very exciting and I'm proud to be a part of it all. Just a few short weeks ago, Duncan Aviation opened its third maintenance facility at the Provo Municipal Airport with several of the same factory authorizations and capabilities as our Battle Creek and Lincoln locations. They can be reviewed on the Provo Fact Sheet. In Provo we have 13 aviation experts serving our customers. Mike Griffiths is our Production Team Leader. Mike has been in aviation for 27 years. He has an A&P license and has worked in our parts department and in airframe shop leadership. Mike has been FlightSafety trained on the Lear 25, 35, 55, 60, Westwind 1124/1224A and Astra 1125/1125SPX. Mike is supported by Todd Walker, an Airframe Tech III, and Ward Cranor, a Mechanic III. Todd has been with Duncan Aviation for 10 years and has held positions including Airframe Mechanic Apprentice and Sheet Metal Tech I through III. Ward Cranor is a Mechanic III. He has been with Duncan Aviation 10 years, most recently holding the position of Team Leader in the Structures shop. Matt Cooper, the Second Shift Supervisor, is the Lead Mechanic with one of our Bombardier teams. He came to Duncan Aviation six years ago from Bombardier Aviation Services-Indianapolis and has 11 years in the industry. Matt holds an associate's degree in aviation technology, an A&P and has an extensive list of formal training on many of the airframes we will specialize in at Provo. Mitch Robson is our Weekend Shift Supervisor. Mitch is also from our Bombardier team and has been with Duncan Aviation for nine years. He has extensive training on Challenger 300s and 600s, including run qualification on the 604. He holds an A&P and was trained in structures and hydraulics with the Navy. Our Lead Engine Mechanic is James Holmes. James has been with Duncan Aviation nine years and has worked in our Engine MPI shop, engine line area and, most recently, has been with Duncan Aviation's Rapid Response engine team based in Florida. Chad Prins, our Avionics Technician III, joined Duncan Aviation in 2001 as an avionics install technician and has been a crew lead for the last four years. Before that, Chad served with the U.S. Air Force and as an avionics technician with USA Jet. He also holds an A&P. Mike Meyer is the Team Leader for our Satellite Avionics Team at Provo. Mike comes to Duncan Aviation with 30 years of avionics experience. He is a licensed private pilot flying both aircraft & helicopters. Jeff Schipper is our Project Manager. Jeff has been with Duncan Aviation since 1987, graduated from Western Michigan University's College of Aviation and has experience working in the paint, interior and airframe shops. Alan Huggett has been traveling the Northwest region as a Duncan Aviation Regional Manager for customers located in the Northwest region including Washington, Idaho, Oregon, Utah, northern Nevada and northern California. Alan spent time in the Air Force as an F-15 mechanic and worked at Flight International as an A&P Lear team member for major inspections. He came to Duncan Aviation in 1998 and has worked as a Tech III on a Learjet team, a project manager and a service sales rep.
Rusty Oneth is the Materials Supervisor for Provo. Joining Duncan Aviation in 2005 in shipping and receiving, Rusty worked his way up to expeditor, Return Goods Administrator and Purchasing Agent. His considerable experience and knowledge in handling materials has been invaluable. Mike Lutz and David Anderson are Provo’s Quality Site Coordinators conducting return to service inspections, logbook research and interacting with the FAA answering regulatory and quality questions. Mike comes to Duncan Aviation with 27 years of aviation experience, most recently from United Space Alliance, a NASA contractor, as a space Shuttle technician. David was most recently the chief inspector of a helicopter engine repair in Utah with 25 years aviation experience. To find out more or to offer suggestions and feedback, please give me a call or send me an email. I look forward to seeing you in Utah!